The economic and monetary disaster which seasoned prognosticator Peter Schiff predicted is no longer hypothetical-it is here today. And nobody understands what to do in this situation better than the man who saw it coming. For more than a decade, Schiff has not only observed the economy, but also helped his clients restructure their portfolios to reflect his outlook. What he sees today is a nation facing an economic storm brought on by growing federal, personal, and corporate debt; too little savings; and a declining dollar. 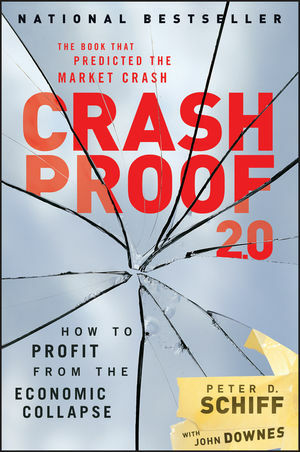 Crash Proof 2.0 picks up right where the first edition-a bestselling book that predicted the current market mayhem-left off. This timely guide takes into account the dramatic economic shifts that are reshaping the world and provides you with the insights and information to navigate the dangerous terrain. Throughout the book, Schiff explains the factors that will affect your future financial stability and offers a specific three step plan to battle the current economic downturn. Filled with in-depth insights and expert advice, Crash Proof 2.0 will help you survive and thrive during the coming years of economic uncertainty. JOHN DOWNES is coauthor of the bestselling Dictionary of Finance and Investment Terms, Barron's Finance and Investment Handbook, and Beating the Dow. He lives in Poughquag, New York.